Before starting my placement at the National Museum of Scotland in Edinburgh, I had visited two or three times. One day was never enough, considering that it houses five different sections, each able to stand as a museum on its own. This is something I really enjoy about it, as a visitor and as an intern, since it offers a holistic approach with connections springing out between topics that might seem unrelated at first glance. Even sharing the morning coffee with staff from World Cultures is a great way to avoid focusing too much on your topic and forgetting about everything else! I came here as part of my Masters in Science Communication and Public Engagement at the University of Edinburgh. With a degree in biology and most of my work experience coming from research labs, I have to confess the museum environment seemed quite daunting, but an interesting challenge anyway. Most of my placement took place at the Department of Science and Technology (Keeper Alexander Hayward). My main supervisor was Klaus Staubermann, Principal Curator of Technology and co-supervisor Alison Taubman, Principal Curator of Communications. On my first day, I was introduced to the Science and Technology Department and also to Learning and Programmes, who gave me an overview of what they do, which was very relevant to my studies. I was taken for a tour around the current Science and Technology galleries and got familiar with some plans for refurbishment and new galleries. My first task was to do some research on 3D printing leading up to an event for the Edinburgh International Science Festival. My core task was to do research on a currently developing gallery about communications, and specifically about recent advances in computing and processing capacity. Here, my background in the life sciences came in handy, since many cutting edge applications (such as the Human Genome Project and the Human Brain Project) depend on supercomputers. I was also encouraged to develop an interactive for this gallery. Walking around the museum and observing to what extent visitors engaged with the interactives was an extremely useful exercise in the process of developing my own. Klaus and Elsa Davidson (Curator of Technology) were kind enough to take me along to a trip to ARTEMIS Intelligent Power, a University of Edinburgh spin-off engineering company developing hydraulic power technologies. There, a possible collaboration was discussed, and we had the chance to look around, meet many employees and learn about the history and objectives of the organization. I was impressed by how many young inspired people worked there and I believe it should be an example for many workplaces. However, I was surprised by the lack of female employees. Are women so uninterested in engineering? Or are there other factors still keeping this profession male-dominated? A peek at the amazing engineering world of ARTEMIS. Image courtesy of Artemis Intelligent Power. 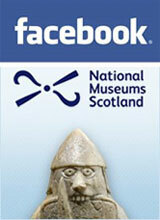 An unforgettable experience was visiting the National Museums Collection Centre at Granton. The amount of objects collected as well as the time span that is covered is truly astonishing. 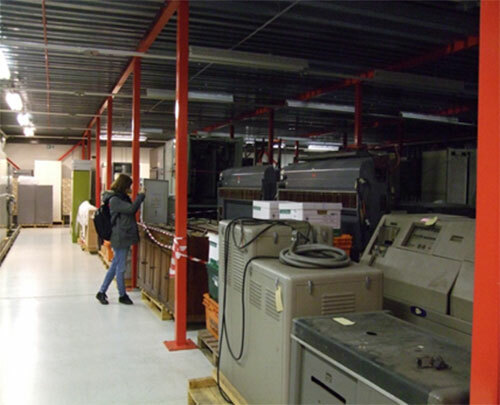 Additionally, seeing objects in storage gives you a good idea of the value of exhibiting and interpreting. Without labels telling stories, the objects appear naked and almost meaningless. Realising the cultural wealth ‘hidden’ in storage and how objects on exhibit are only the surface of this treasure was something unexpected. Me marvelling at the heart of ATLAS, one of the world’s first supercomputers, at Granton. During my placement, I also had the chance to meet the Communications team and had a chat with Communications Officer Bruce Blacklaw about various roles in the interface between the Museum and the ‘outside’ world (marketing, PR, media and press relations). We also discussed what makes a topic newsworthy and how an interesting and informing press release should look. I wrote my own press release about the Mammoth Poo Detectives workshop planned for the Edinburgh International Science Festival and was glad to know it would actually be used by the Department. I also attended a photo shoot for a newspaper feature on the Wildlife Photographer of the Year exhibition, which was exciting not least because of the privilege of seeing an exhibition before it was officially launched. Finally, I had a brief discussion with Development Manager Charlotte di Corpo about fundraising and met Rose Watban, Curator of Modern and Contemporary Design in the Art and Design Department, to find out about the history of some of the collections, the challenges of bringing a gallery together and the infinite possibilities for inter-departmental collaborations. 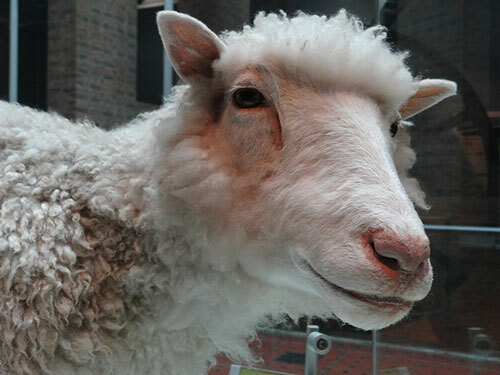 Overall, my experience as an intern at the Museum was very interesting and rewarding. Klaus and Alison ensured I had great guidance and used my time productively, but also Maureen Kerr, Departmental Administrator, made sure my placement ran smoothly. Everyone at the Department of Science and Technology was very friendly and helpful, and people from other departments were happy to give me an idea of the work they do. 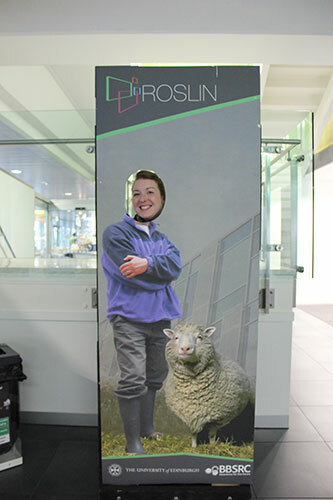 I have to say I enjoyed my time here, met some lovely people, and enriched my own set of skills. Last but not least, I got familiar with a workplace I knew very little about and will consider further volunteering and maybe even work experience in the museums sector. 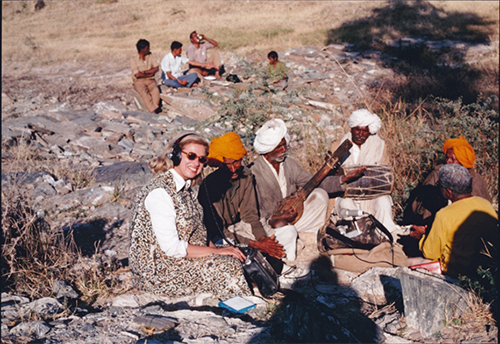 I am a Los Angeles, California, girl who chose to do her Conservation training at University College London, Institute of Archaeology. Just as I thought the weather could not possibly get any colder, I applied to do my third year internship in Scotland. Since arriving in Edinburgh at the end of September 2012, I can honestly say I have seen it snow more times than I had ever seen before in my life! Now that my time here in the Artefacts Conservation section at the National Museums Collection Centre is ending, I thought I would write a blog post about what my MSc dissertation research into the potentiostatic reduction of lead corrosion has achieved. I have been working on 156 bullets and casings found near the Special Training Centre Lochailort (1940-1942; site near Inverailort). This was the first Royal Commando training centre set up during WWII. The bullets were found, buried in the ground, near a derelict building which is a possible site of the first ‘mystery house’. Trainees would have been sent into this building to test their new skills in an unknown scenario. Small arms ammunition; 156 bullets and casings. The bullets and casings were found buried in the ground. The National Museums Scotland collection is just a trowel full taken from this pit (Photograph courtesy of Stuart Allan, Senior Curator National War Museum, Edinburgh). My work on the bullets was two-fold. First, by studying these bullets and the casing head stamps (impressed markings that indicate country and calibre) I could shed light on the types of ammunition and possibly also the weapons that were used at this site. 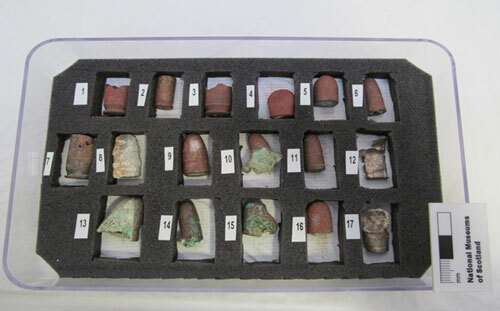 Secondly, as Stuart Allan, Senior Curator of Military Collections, was concerned about corrosion to the bullets, I needed to determine a good bulk conservation treatment which could efficiently treat all 156 objects so that they could be displayed in the future. 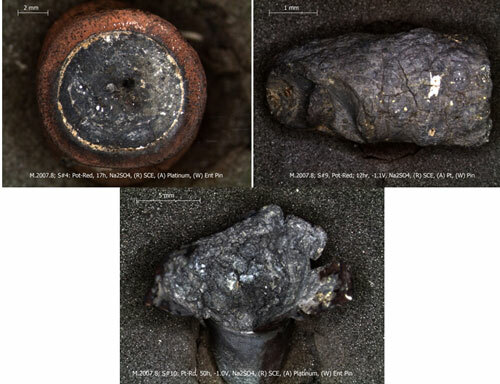 The types of bullets and casings found in the collection, tentatively identified as a rifle round (top-left), a .45 calibre (top-centre), and a .32 calibre (top-right). The types of head stamps present are an ELEY 328-65 (British), REM-UMC .45 ACP (American), WESTERN .45 AUTO (American), W.R.A.Co .45 A.C. (American). Therefore the likely weapons used at this site were pistols, sub-machine guns, and rifles. 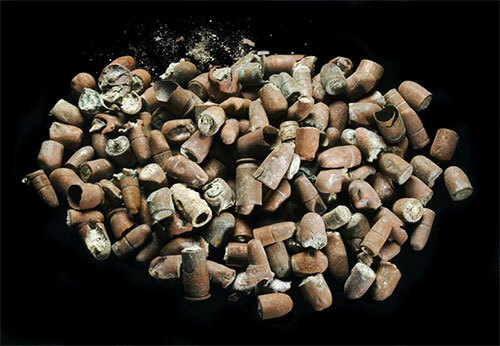 Because these bullets have corroding lead (Pb) cores, which are very toxic, this presented a health and safety risk to researchers and visitors, and this needed to be resolved before they could be displayed (and before the metal corrodes completely to dust!). 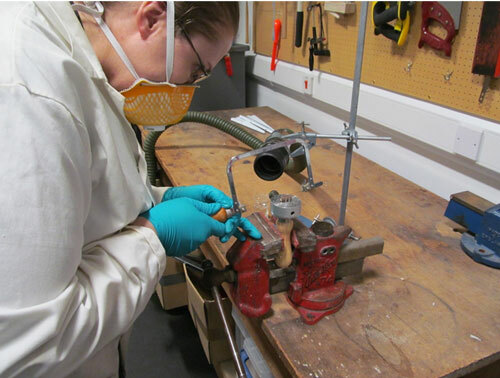 Therefore, when I worked with the objects I wore protective gear and used other equipment to contain the lead corrosion products so that I and the other conservators would be safe. Gloves, eye-glasses, lab coat, and face mask must be worn when working with the lead corrosion, while a filter vacuum is used to contain the toxic dust. First, I sorted the bullets visually into sizes and types, then I chose seventeen samples (four casings and thirteen bullets) which were representative of the types and corrosion products present. These would be used to analyze for composition (to see which metal alloys were present) and to undergo potentiostatic trials. 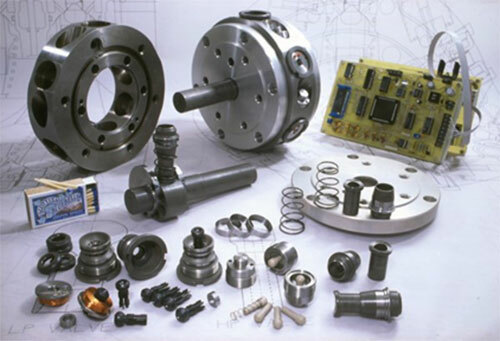 Seventeen samples represented the four types of casing headstamps, the different types of bullets, metal alloys, and corrosion products visibly present. To understand the types of metal alloys and corrosion products present I turned to several analytical techniques in addition to the desk microscope to assist me. 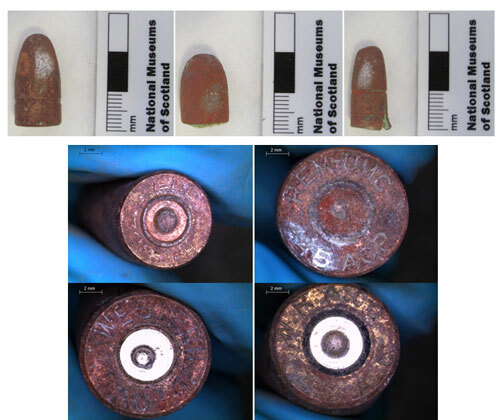 With the help and expertise of Conservation Scientist Lore Troalen, x-ray fluorescence (XRF) was utilized to provide me with an elemental composition of the bullet shells and the casings. With this technique it was determined that there were two alloys present: copper-zinc (‘.45 calibre’) and copper-nickel (‘.32 calibre’ and ‘rifle rounds’). The cores were determined to be lead. Two types of corrosion products were visibly present: a primary, white corrosion and a secondary green corrosion which appeared either as compact and dark green or as nodular and light green-blue. The types of corrosion present appear either compact or voluminous and are either plain white corrosion or a secondary light green-blue or dark green corrosion. 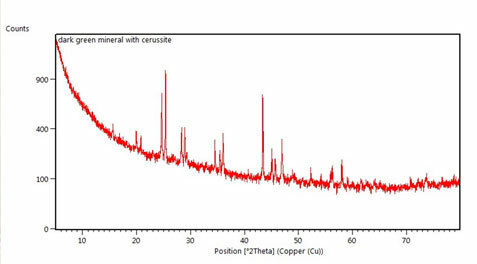 With the expertise of Peter Davidson, Curator of Minerals, x-ray diffraction (XRD) analysis was used to determine that the white corrosion was Cerussite (lead carbonate). However, the two green corrosion products were not as easily defined by this technique. In addition, after potentiostatic reduction trials were run on several sample bullets, XRD was used a second time to confirm that lead metal had been formed. This was the most exciting test as it showed that my project was successful! Bullet in position for XRF analysis (left). Sample 9 spectra (right). The results show the presence of Pb, small amount of Cu, Ni, Fe, Zn. The type of equipment used was a XRF Oxford ED2000. Sample 15 diffractogram showing that the white corrosion product is cerussite + unidentified phases (green corrosion products). 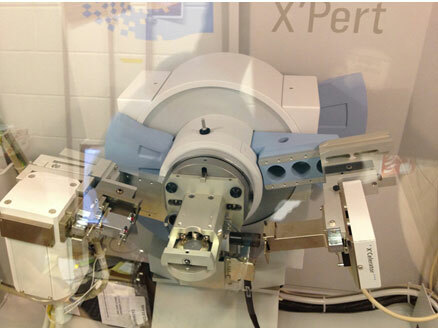 The equipment used was a XRD PANalytical X’Pert Powder. Because the green corrosion could not be identified by XRD, scanning electron microscopy (SEM) was used to help determine which elements were present in the green corrosion products. The backscatter micrographs were truly amazing to me, as they illustrated how beautiful a mineral can look when viewed at such a magnification. This technique also indicated that these were copper-based minerals and possibly more non-crystalline in nature than previously thought. Therefore, future tests will involve Fourier transform infrared spectroscopy (FTIR) which can better identify non-crystalline and organic materials. 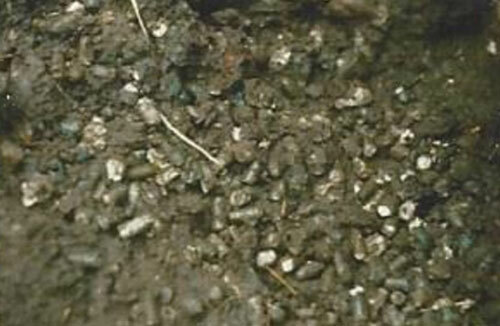 Sample bullet #4 showed the earliest successful reduction of lead carbonate to lead metal (left image). The backscatter micrograph (SEM-BSC) showed two phases present: one more needle-like or dendritic (Phase 1) and one more compact and globular (Phase 2). The light green-blue corrosion that appeared nodular under a desk microscope (left image) appear drastically different using SEM. In the SEM-BSC mircograph this corrosion appears fiborous and almost flower-like in structure (right image). The dark green corrosion product (left image) was strongly adhered to the white corrosion layer beneath it. This made taking ‘pure’ samples for XRD analysis difficult. In this SEM-BSC micrograph (right image) the lead carbonate appears brilliant white and is adhered to the dark green corrosion. To treat the bullets I chose an electrochemical technique called Potentiostatic Reduction. 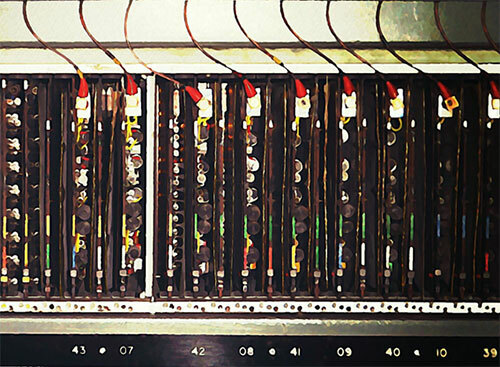 This process utilizes a potentiostat machine which, with the aid of computer software, can help determine a safe electrical current to push through the circuit to reduce the corrosion to metal. Initially the software is set to run potentiodynamic scans which display a unique signature peak corresponding to the specific metal or alloy which is to be reduced. This allows me to be more selective in what potential difference (voltage) I should choose to run my trials. If I set the potential difference too low then nothing will happen and the electrolyte solution may attack the metal. If I set the potential difference and current too high hydrogen evolution (bubbles) may form. Sycopel Enhanced Ministat potentiostat (model 256E) and PC-100 digital controller with software. The aim of determining a safe current range for reduction is to avoid the rapid formation of hydrogen gas which evolves off the surface and within the structure as tiny bubbles. When the experiment is running correctly very few hydrogen bubbles will be formed on the object. Oftentimes the object to be reduced is extremely fragile, thus, the rapid evolution of hydrogen could be enough to shatter the object apart! Rapid hydrogen evolution can be seen streaming off of this mock ‘bullet’ which I created to test the cell before an actual bullet was tested. 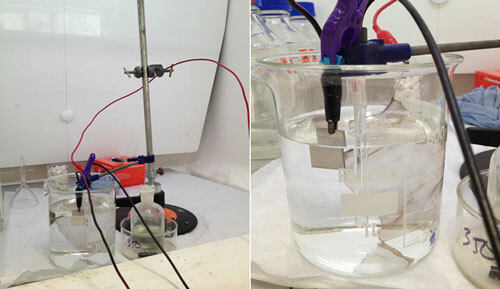 The electrochemical cell set-up. I used a platinum mesh for the anode and a calomel electrode as reference. Two electrolytes were chosen to test, sodium sesquicarbonate and sodium sulphate. 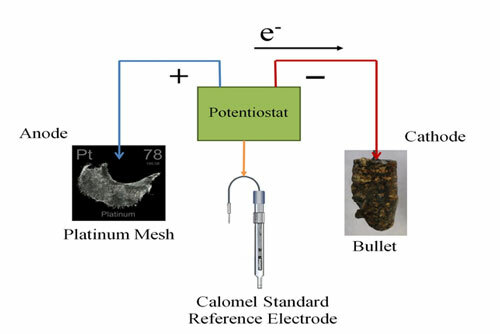 The bullet was connected to the system as the cathode, the platinum mesh was connected as the anode, and a Calomel Reference electrode was included in the cell to monitor the potential drop occurring at the cathode. This reference electrode allows the potentiostat to adjust the potential (voltage) at the cathode, in order to keep it constant. The potentiostat is set up so that I can monitor the current through the bullet (cathode). When it settles on a current for a duration of time, I can then assume that all the corrosion that will reduce to metal has done so and the experiment can be stopped. 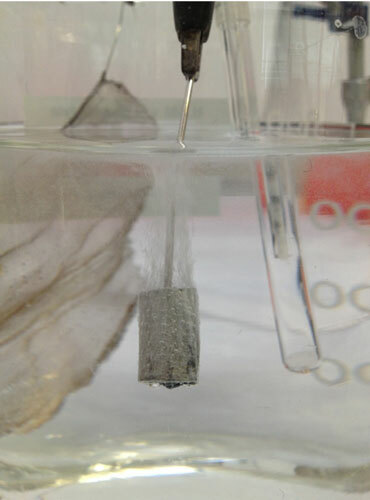 The bullet is then rinsed and dried and stored in an air-tight container. Diagram of my electrochemical cell, representing the placement of the object (cathode), the platinum mesh (anode) within the cell. The current is pushed through the bullet first, which provides the necessary electrons needed to reduce the lead carbonate back to lead metal. Samples #4, #9, and #10 – after potentiostatic reduction treatment was complete. Well, if you have all stayed with me and read this far, then I guess the big question is: “Did I have any success?” My overexcited answer is “YES!! 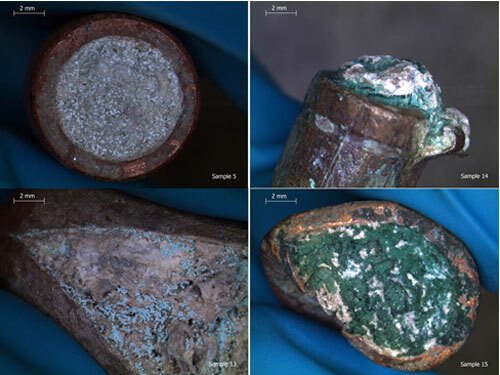 !” I was very happy to be able to reduce three different bullets and demonstrate that both copper-zinc and copper-nickel alloy shells in galvanic connection with a lead core could be reduced, as well as bullets with the secondary green corrosion. I was also able to set up a cell with two bullets and have both bullets reduce at once. This means that future testing can begin on creating multiple-cells, with 5-10 bullets, which will allow all 156 bullets to be reduced efficiently! Thank you for reading through my blog post and many thanks to the conservators, curators, and site staff that made my time at National Museums Collection Centre wonderful. I wish I didn’t have to leave! Now back to typing up my dissertation! In June, I began a year’s Institute of Conservation (ICON) internship as a Science Conservation Intern, funded by Heritage Lottery Fund. The first three months were spent at the analytical research labs of the Conservation and Analytical Research Section (CAR) in Granton. Having been a research chemist for 18 years prior to my internship, where I worked on a variety of multidisciplinary projects, the skills acquired during that time have helped me enormously in my new role. In recent decades, museums have become aware that objects made from plastics (polymers) are subject to degradation from heat, light and moisture as well as physical damage. 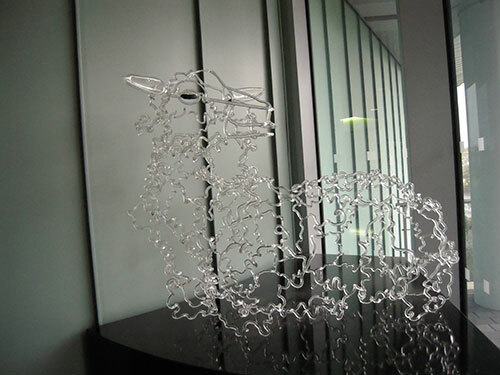 Sometimes termed modern materials, these objects can be anything from an acrylic sculpture to a PVC raincoat. This has resulted in concern regarding their lifespan within the heritage sector and therefore significant research on their properties, degradation and long-term storage is a key issue for museums with significant object collections of modern materials. While at National Museums Scotland, most of my time was spent working on these modern materials. This collection contains a huge variety of plastic objects, primarily manufactured in the 20th century, illustrating the development of plastics from the semi-synthetic to the synthetic. This allowed a database of these objects to be created, which will be used in the future to monitor degradation and inform curators of likely areas of concern specific to each polymer. All these objects had been photographed in 2000, although not described in detail, and visual comparisons were made using this photographic record to their current condition. Modern materials such as polymers can be identified and their condition determined using Attenuated Total Reflectance/Fourier Transform Infrared (ATR/FT-IR). This technique creates a spectrum which provides a unique fingerprint of the polymer based on the vibrational energies of the molecules present in it. The technique allows objects (if small enough) or parts of larger objects to be studied non-destructively. The technique is very fast as no sample preparation is required and scans can take as little as one minute depending on the detail required. CAR has an extensive collection of polymer samples obtained in the 1990s from companies such as BASF, BP and Courtaulds. Using these polymers I created libraries which can now be used in the future to identify unknown materials. Working in the Conservation & Analytical Research lab. National Museums Scotland recently obtained a collection of prosthetic limbs which are fabricated from a variety of polymers and metals and cover a period of prosthetic research and development in Edinburgh from the 1960s to the present day. The driver for such prosthetic development was to fit children born with no or shortened limbs due to the anti-nausea drug thalidomide. My part in this project has been to assess the current condition of a selection of prosthetic limbs and to determine the materials they have been constructed from. I have done this by using three analytical techniques: Fourier Transform Infrared (FT-IR) (used for polymer identification and quality) and X-ray Fluorescence (XRF) (used to identify metals) to identify the materials and X-rays to determine the internal mechanisms present in the limbs. The subsequent analysis showed that the metal used in the mechanism was stainless steel. The prosthetics also frequently have fabric fastenings and coverings and in older samples leather is sometimes used. Examining a prosthetic limb in the lab. National Museums Scotland holds a variety of jewellery, hats and buttons by Jean Muir, which form part of a larger collection relating to this iconic designer. The jewellery in the main is made from plastic (polymers), some transparent and others pieces colored. In addition there were some silver pieces. The conservation reporting and creation of new accessible storage solutions for these objects was carried out by Clare Berthommier, a visiting intern. As part of her task she wished to identify the materials these objects were made from, as this would help her to decide how they should be stored. Clare and I worked together on identifying the plastics, and we also found that some of the jewellery was made from silver. Some of the bracelets were flat discs, which were ideal for FT-IR scanning using the ATR attachment. Of the pieces analysed all were identified as poly(methyl methacrylate) (PMMA) often known by names such as Perspex or Plexiglass. While at National Museums Scotland I accompanied a group of scientists and curators on a visit to the Clinical Research Imaging Centre at the Royal Infirmary Edinburgh. Work had been carried out there on the scanning of mummies from the collection. I attended the Getty funded Research Network Meeting on Modern Materials in June. The purpose of the meeting was to create ideas for future projects in the understanding and preservation of modern materials. Delegates from a variety of countries attended this event. On 28 July Dr Jim Tate and I visited Dr Andrea Hamilton at the Centre for Materials Science and Engineering at Edinburgh University to view and discuss the capabilities of the Atomic Force Microscope (AFM) they have within their department. Our application was to use AFM to monitor the degradation of the surface of plastics as an aid to understanding the degradation process in addition to other techniques. I visited Hampton Court on 17 August with other ICON interns. 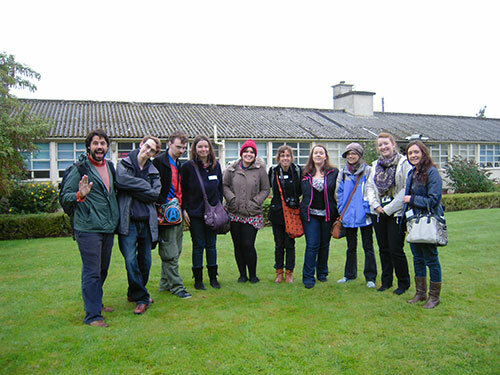 The day kicked off with a talk by Miriam Langford, the Treatment Conservation Manager. In it she described the projects we would view, which included the conservation on a tapestry based on a design by Raphael, Queen Anne state bed and Queen Victoria’s dolls. 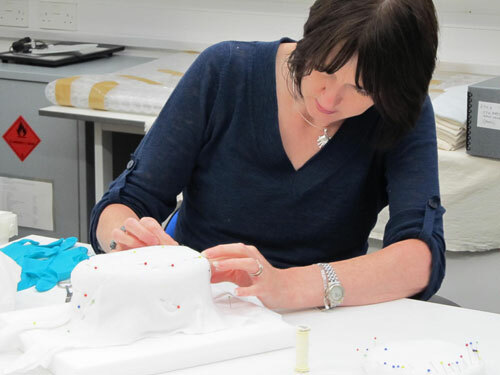 The rest of the day was spent viewing the studios and as a scientist it was very enlightening to see conservators at work: it highlighted the dedication, skill and patience required by them. On 23 August I visited the Liverpool museums. In the morning a tour of the conservation centre took place, where we viewed the conservation and restoration of model ships, of which the museum has many as a result of Liverpool’s famous shipping past. After lunch we were taken on a visit to the recently opened Museum of Liverpool, designed by the Danish architects 3XN. It has an eclectic mix of objects ranging from Liverpool’s sea trading past to Beatles memorabilia. The three months of my internship have been busy, varied and motivating. I feel privileged to have been given the opportunity to be part of the HLF Internship program. My time at National Museums Scotland has given me a real insight into the museum sector and how it operates. It has been a mix of lab work, research reading, visits, being part of meetings and planning future work. From day one I felt part of the team and I hope that I contributed to the CAR department. I anticipate that the relationships I have made here will continue throughout my internship and perhaps beyond.